The Seahawks QB threw for a team-record 452 yards, but the Seahawks’ defense gets a C-minus after giving up too many big plays in a 41-38 win over the Texans. The season isn’t even half way over and the Seahawks have won games just about every way imaginable en route to a 5-2 record. They’ve won 12-9 snoozefests against the lowly 49ers. Held the top-scoring team in the NFL, the Rams, to a lone touchdown. Had the predictable blowout against the Colts. And Sunday, going against what came in as the hottest offense in the NFL, they won a 41-38 shootout over Houston, the kind of Seahawks game rarely seen in the Pete Carroll era. “I thought it was a fantastic day for our players and our team and to see what it takes, sometimes, to win a game where you need both sides of the ball to come through when the time is right,’’ Carroll said. Indeed, depending on how the rest of this season develops, Sunday might be remembered as the day when the Seahawks became a team in the truest sense of the word. Now on to some grades. So this game should end forever any talk of Russell Wilson being a game manager, even if such talk has not made any sense for a long time. Seattle likely loses this game in decisive fashion with just about anyone other than a couple of other quarterbacks considering the lack of a running game and the way the defense played. But Wilson was electric in throwing for a team-record 452 yards along with four touchdowns and leading the amazing final drive. Wilson’s passer rating for the season is now up to 100.4 — it dipped to 92.6 last year as he battled injuries — and he’s on pace for 34 TD passes that would tie his 2015 team record. The MVP talk should begin shortly. The receiving corps also keeps showing it might be more varied than thought as it was Tyler Lockett (121 yards) and Paul Richardson (105) leading the way with Seattle also getting well-timed, if surprising, big plays from the likes of Tanner McEvoy (53 yards on his first catch of the season) and fullback Tre Madden (66 yards on his second catch this season). The offensive line deserves immense credit for protecting Wilson well enough — he was sacked twice and hit just six times on 41 attempts. Justin Britt was able to play despite a sprained ankle and Ethan Pocic went the entire way at left guard. But the running game is in shambles and it’s hard to figure Seattle can keep winning getting so little out of it. Sunday, Seattle had 33 yards on 21 carries with 30 yards by Wilson. Thomas Rawls becomes even more of an enigma each week as Sunday he had six carries for minus-1 yard and dropped a potential touchdown pass. But overcoming all that to score 41 is good enough for a good grade. Well, maybe Seattle’s defense isn’t quite back to its 2013 level after all. 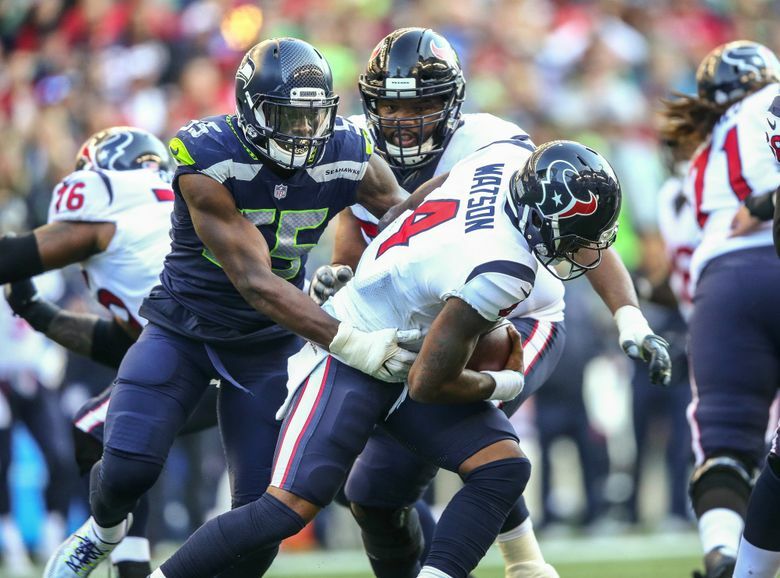 Going against an offense that had scored at least 33 or more points in its past four games, Seattle had no more clue how to slow down Deshaun Watson and crew than anyone else has. The Seahawks gave up their first touchdown in the first quarter this year, and were rolled through like rarely before in the first half as the Texans scored 21 points on three drives of 75 yards or longer. Seattle also gave up its first touchdown of any kind in the fourth quarter. But the victory will make the film look a little better and there were a few highlights. Specifically, Earl Thomas had the pick-six when it looked like the game might be 14-0 Houston pretty quickly; Frank Clark had two sacks; newcomer Dwight Freeney made an immediate impact getting consistent pressure and credited with half a sack; Richard Sherman had his first two interceptions of the season; and rookie Shaquill Griffin hung tough and had two passes defensed. As Sherman said, this wasn’t the best day ever for the Seattle defense. But the fact it basically scored 10 points and got the key stop at the end at least allows it to not flunk. In a game with so many big plays, the special teams didn’t seem like a huge factor with neither team doing much in the return game and each team making all of the field goals and PATs that were attempted. One standout was McEvoy, who forced a fumble that Houston got back on one kickoff return and then blew through moments later to almost block a punt. Another was Madden, who had two tackles in coverage, one coming on the kickoff following the field goal set up by his long reception.